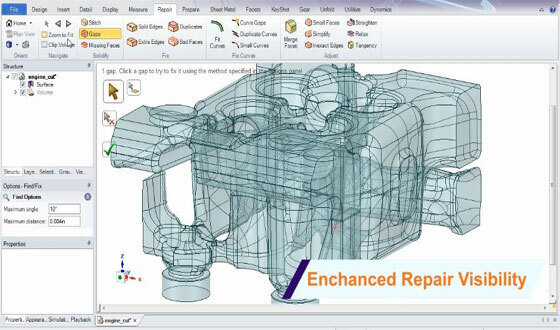 ANSYS, Inc., the leading developer of simulation software for engineering sectors, has just launched the 2015 version of its ANSYS SpaceClaim direct modeling solution. With SpaceClaim 2015, the engineers can find a better way to deal with geometry as well as generating, editing and patching up 3d models efficiently. Besides, the engineers can speed up their work by editing and managing of faceted models. While producing or editing 3d models, the engineers can make complicated geometry easily. SpaceClaim is now compatible with ANSYS Neutral File (ANF) format export. It is now incorporated with ANSYS Workbench to import geometry from ANSYS Workbench and ANSYS DesignModeler into SpaceClaim. This feature will facilitate the engineers to concentrate their time and proficiency on simulation analysis rather creating geometry. As for instance, if the engineers are engaged in making computational fluid dynamics (CFD) analysis, they can use the new features in SpaceClaim to take out the fluid volume of designs. So they don’t have to depend on CAD engineers to edit geometries for them. The simulation preparation method is improved with the inclusion of new imprint and wrap tools for having superior control over connections amid parts. Some new toolset like simulation cleanup and detection tools for short edges, overlapped faces and corrupt faces are included with SpaceClaim 2015. With SpaceClaim 2015, the users will be able to get dimensions from the Pull tool edge pivot and import layer contents into selection sets. For design and modeling, SpaceClaim 2015 can improve your design and modeling work has been upgraded with the features like pivoting of surface edges and vertices and tangent/natural extensions for curves and surfaces. Blends are also upgraded with the addition of a blend to point capability. Reverse engineering process gets better with a purposeful mesh curve fitting tool and snap to point. SpaceClaim’s 3D Printing module contains additional tools for fixing models and examining print success. Besides, one can enjoy the features like direct editing of meshes with SpaceClaim’s intuitive Pull and Move tools to prepare models 3d printable easily and quickly. The newest plugin for MakerBot uploads is also part of the 2015 release of SpaceClaim.